The idea that a company can increase their competitiveness by focusing on how a company interacts with its customers is not new but little has been accomplished to this end across corporate America. In 1992 the Harvard Business Review published a ground-breaking paper called Staple Yourself to an Order. I came across this paper several years after it was written, while I was in an operations and logistics role and it captured my imagination. In essence what the paper was saying is that companies did not have an end-to-end process around customer relationship management. There were no processes in place to manage the customer at every interaction point in a consistent manner. 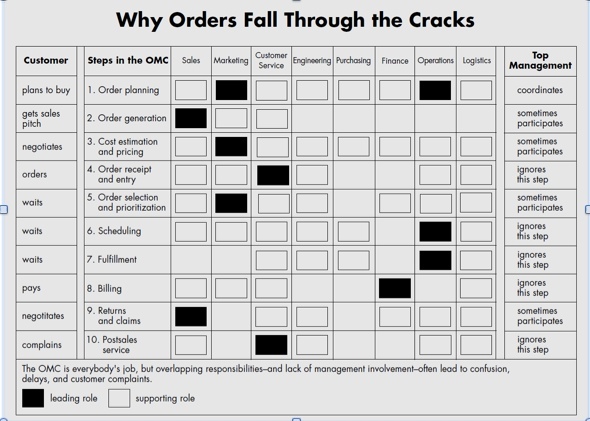 There is a great chart in this document on page 6 entitled "Why Orders Fall through the Cracks" (see below) that really captures the issue and illustrates a typical organizational structure and what happens to a customer going through the entire process of placing an order. It seems companies (twenty years hence) are now becoming aware of the opportunity to increase competitive advantage by focusing on the order management process. In 2011 IBM got behind this concept and updated the idea in their paper Re-staple Yourself to an Order. As IBM points out the world has become more complex now and customers interact with companies through the web and mobile technologies and by numerous other means. Interestingly though, their analysis of companies today is, and I quote: "One key factor is that rarely is there a clear ‘owner’ of the order management process within the business." "It is common that no one individual or function owns the process and systems to support order management end to end." In my view, Marketing is the appropriate owner of the order management process, but I believe IBM and others have it wrong in their assessment of what the process really should entail. In the IBM view, Order Management incorporates a slice of order capture, traditional order management, order fulfillment and billing. These are discrete and separate processes in a company with multiple process owners. I believe that to truly embrace the customer, a company needs to develop an end-to-end process that incorporates (i) managing the strategic forecast, (ii) all of order capture, (iii) order management, (iv) order fulfillment and (v) billing. No one in an organization can put their hand up and say "I can and will own this process from end to end" except Marketing. The trouble is that many marketers do not understand supply chain management or even why they should become competent in this discipline. It does however become very apparent once you read Staple Yourself to an Order. The head of Marketing would then become the Chief Customer Officer as was discussed in a recent blog of mine The CMO is Dead? Long live the CEO-CMO! To view this from a different angle, there is a blog by Art Saxby about the Demand Chain. What I am proposing does not conflict with this view but rather puts a process model around it and establishes a process owner. The process could very easily be called the Demand Chain Process instead of what I referred to in an earlier blog as the Customer Order Fulfillment Process. Texas CEO Magazine did a great job of outlining the 3 disciplines required for Demand Chain Optimization. What I am proposing here is one way for a company to become market-driven and way to implement it in your organization. Finally, a comment about technology solutions for supply chain management and enterprise resource management: I do not advocate throwing technology at the problem. That is never a good idea: just ask anyone who has tried to implement an ERP system. The appropriate scenario is to try to capture all the process in the company around the customer and automate same. Due to the complexities of these processes and lack of singular ownership, most companies give up and default to the finance component of the system and may never get to the rest of the ERP system capabilities. Process is always first, and automation should always be second.